A monoplane has inherently the highest efficiency and lowest drag of any wing configuration and is the simplest to build. However, during the early years of flight, these advantages were offset by its greater weight and lower manoeuvrability, making it relatively rare until the 1930s. Since then, the monoplane has been the most common form for a fixed-wing aircraft. The inherent efficiency of the monoplane can best be realized in the unbraced cantilever wing, which carries all structural forces internally. By contrast, a braced wing has additional drag from the exposed bracing struts or wires, lowering aerodynamic efficiency. On the other hand, the braced wing has greater structural efficiency and can be made much lighter. This in turn means that for a wing of a given size, bracing allows it to fly slower with a lower-powered engine, while a heavy cantilever wing needs a more powerful engine and can fly faster. Besides the general variations in wing configuration such as tail position and use of bracing, the main distinction between types of monoplane is how high up the wings are mounted in relation to the fuselage. A low wing is one which is located on or near the base of the fuselage. Placing the wing low down allows good visibility upwards and frees up the central fuselage from the wing spar carry-through. By reducing pendulum stability, it makes the aircraft more manoeuvrable, as on the Spitfire; but aircraft that value stability over manoeuvrability may then need some dihedral. A feature of the low wing position is its significant ground effect, giving the plane a tendency to float further before landing. Conversely, this ground effect permits shorter takeoffs. A mid wing is mounted midway up the fuselage. The carry-through spar structure can reduce the useful fuselage volume near its centre of gravity, where space is often in most demand. A shoulder wing (a category between high-wing and mid-wing) is a configuration whereby the wing is mounted near the top of the fuselage but not on the very top. It is so called because it sits on the "shoulder" of the fuselage, rather than on the pilot's shoulder. Shoulder-wings and high-wings share some characteristics, namely: they support a pendulous fuselage which requires no wing dihedral for stability; and, by comparison with a low-wing, a shoulder-wing's limited ground effect reduces float on landing. 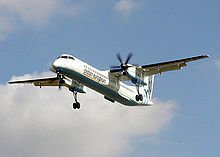 Compared to a low-wing, shoulder-wing and high-wing configurations give increased propeller clearance on multi-engined aircraft. On a large aircraft, there is little practical difference between a shoulder wing and a high wing; but on light aircraft, the configuration is significant because it offers superior visibility to the pilot. On a light aircraft, the shoulder-wing may need to be swept forward to maintain correct center of gravity. Examples of light aircraft with shoulder wings include the ARV Super2, the Bölkow Junior, Saab Safari and the Barber Snark. A high wing has its upper surface on or above the top of the fuselage. It shares many advantages and disadvantages with the shoulder wing, but on a light aircraft, the high wing has poorer upwards visibility. On light aircraft such as the Cessna 152, the wing is usually located on top of the pilot's cabin, so that the centre of lift broadly coincides with the centre of gravity. A parasol wing aircraft is essentially a biplane without the lower pair of wings. The parasol wing is not directly attached to the fuselage, but is held above it, supported either by cabane struts or by a single pylon. Additional bracing may be provided by struts extending from the fuselage sides. Some early gliders had an open cockpit and a parasol wing mounted on a pylon. The parasol wing was popular only during the interwar transition years between biplanes and monoplanes. Compared to a biplane, a parasol wing has less bracing and lower drag; but compared to a high wing, there is so much extra drag that the parasol wing has become obsolete for production aircraft, although it remains a popular configuration for homebuilt aircraft, such as the Pietenpol Air Camper. The Santos-Dumont Demoiselle was the first production monoplane (replica shown). Although the first successful aircraft were biplanes, the first attempts at heavier-than-air flying machines were monoplanes, and many pioneers continued to develop monoplane designs. For example, the first aeroplane to be put into production was the 1907 Santos-Dumont Demoiselle, while the Blériot XI flew across the English Channel in 1909. Throughout 1909–1910, Hubert Latham set multiple altitude records in his Antoinette IV monoplane, eventually reaching 1,384 m (4,541 ft). The Junkers J 1 monoplane pioneered all-metal construction in 1915. The equivalent German language term is Eindecker, as in the mid-wing Fokker Eindecker fighter of 1915 which for a time dominated the skies in what became known as the "Fokker scourge". The German military Idflieg aircraft designation system prior to 1918 prefixed monoplane type designations with an E, until the approval of the Fokker D.VIII fighter from its former "E.V" designation. However, the success of the Fokker was short-lived, and World War I was dominated by biplanes. Towards the end of the war, the parasol monoplane became popular and successful designs were produced into the 1920s. Nonetheless, relatively few monoplane types were built between 1914 and the late 1920s, compared with the number of biplanes. The reasons for this were primarily practical. With the low engine powers and airspeeds available, the wings of a monoplane needed to be large in order to create enough lift while a biplane could have two smaller wings and so be made smaller and lighter. Towards the end of the First World War, the inherent high drag of the biplane was beginning to restrict performance. Engines were not yet powerful enough to make the heavy cantilever-wing monoplane viable, and the braced parasol wing became popular on fighter aircraft, although few arrived in time to see combat. It remained popular throughout the 1920s. On flying boats with a shallow hull, a parasol wing allows the engines to be mounted above the spray from the water when taking off and landing. It was popular on flying boats during the 1930s; a typical example being the Consolidated PBY Catalina. It died out when taller hulls became the norm during World War II, allowing the wing to be attached directly to the hull. As ever-increasing engine powers made the weight of all-metal construction and the cantilever wing more practical — both first pioneered together by the revolutionary German Junkers J 1 factory demonstrator in 1915–16 — they became common during the post–World War I period, the day of the braced wing passed, and by the 1930s, the cantilever monoplane was fast becoming the standard configuration for a fixed-wing aircraft. Advanced monoplane fighter-aircraft designs were mass-produced for military services around the world in both the Soviet Union and the United States in the early–mid 1930s, with the Polikarpov I-16 and the Boeing P-26 Peashooter respectively. Most military aircraft of WWII were monoplanes, as have been virtually all aircraft since. Jet and rocket engines have even more power, and all modern high-speed aircraft, especially supersonic types, have been monoplanes. ^ "Why are there no longer any biplanes?". Aviation Stack Exchange. Retrieved 4 August 2018. ^ "ch4-3". nasa.gov. Retrieved 16 January 2016. ^ "Ground Effect in Aircraft". Aviation-history.com. 2009-11-30. Retrieved 2012-07-19. ^ "Ground Effect". Avweb.com. 2003-10-22. Retrieved 2012-07-19. ^ Rarely an exact coincidence: most high-wing aircraft have the centre of lift just aft of the GG, to provide a nose-down moment (that can be countered by tailplane downforce). ^ King, Windkiller, p. 227. This page was last edited on 17 March 2019, at 13:50 (UTC).